Waggamba Shire, an area of 13,400 sq km in south-east Queensland, entirely surrounded the town of Goondiwindi and adjoined the New South Wales state border. Most of the shire's southern border was the Dumaresq and Macintyre Rivers. In 2008 the Shire was amalgamated with Goondiwindi Town and Inglewood Shire to form Goondiwindi Regional Council. Pastoral occupation in the Waggamba district began in the late 1830s (the Gundawindi pastoral run), with more intense occupation occurring in the 1850s. The Callandoon station, west of Goondiwindi was the district's first place of civil administration, when a court house was erected there in 1860. It was Goondiwindi, however, a stopping place for teamsters, that became the district's town centre. 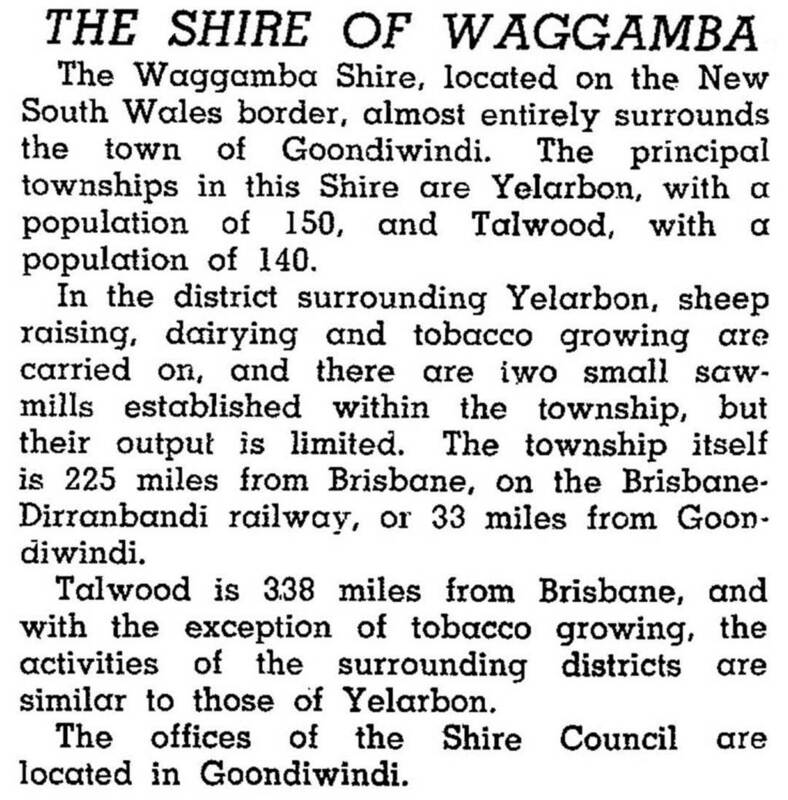 When the Waggamba local government division was proclaimed in 1879 Goondiwindi was the natural choice for its shire office. The former shire's most fertile area is the river flats around Goondiwindi. West of Goondiwindi the Macintyre River develops channels and anabranches. Floods are common, particularly when the Macintyre has high rainfall in its upper reaches. Originally large areas of scrub and forest existed north of the river flats. Clearing has been intense, often troubled by brigalow regrowth. That, however, was secondary to the general prickly pear infestation of most cleared land, apparently beginning from a garden plant at the Billa Billa station in 1860. Removal of the prickly pear in the 1930s released farm land and depleted the protective cover for rabbit plagues, which kept a rabbit freezing works going out at Yelarbon. The rabbit pest continued until myxomatosis control in the 1950s. In 1908 the railway was taken westwards through the shire from Warwick. It stimulated closer-settlement, particularly near its western boundary at Weengallon. Artesian bores successfully brought water to the surface in 1914-17, and open channels carried it to farm dams. Goondiwindi was separated from the shire in 1888 and made a separate municipality.